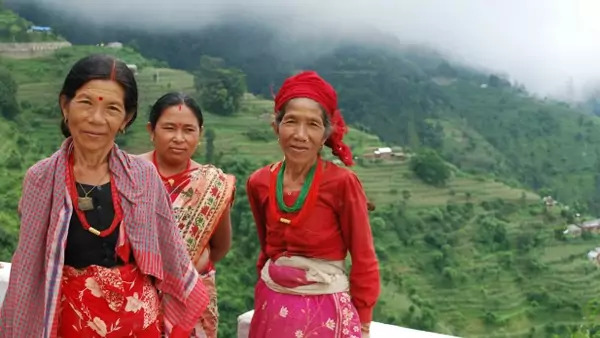 Nepali women, clients of Accountability Counsel, challenge a World Bank-funded transmission line endangering their community (Courtesy Komala Ramachandra/ Accountability Counsel). Emerging Voices features contributions from scholars and practitioners highlighting new research, thinking, and approaches to development challenges. This article is by Natalie Bridgeman Fields, Esq., founder and executive director of Accountability Counsel, and Kindra Mohr, Esq., Accountability Counsel’s policy director. Accountability Counsel is a non-profit legal organization that defends the environmental and human rights of communities around the world that are harmed by internationally-financed development projects. The World Bank faces a disconnect between its mission to serve the poor and the effects of its projects, some of which displaced 3.4 million people in the world’s most fragile regions over the past nine years. Last month, World Bank President Jim Yong Kim admitted to known, longstanding problems with the Bank’s resettlement policies and released three internal reviews revealing the Bank’s failure to collect even minimal information on resettlement, such as the number of people displaced and whether they had received remuneration for their displacement. In our own work at Accountability Counsel, we represent people affected by projects funded, designed, or implemented by the Bank. Through their experiences, we have glimpsed how Bank projects not only harm people, but also call the Bank’s legitimacy into question. In response to early resettlement failures, the Bank, in 1993, created an accountability office called the Inspection Panel. The Panel, walled off from Bank management and reporting directly to the Bank’s board of directors, was designed to ensure that projects comply with internal policies protecting human and environmental rights. Since its inception, the Panel has made significant contributions to accountability and transparency, fielding complaints from people harmed by Bank activities and investigating violations of internal policy. However, as recent cases show, the Panel is losing touch with its mission to serve as an impartial check on Bank activities. In one example, the Ethiopian government made use of Bank funding to forcibly evict indigenous people from their land. The Panel’s investigation acknowledged the connection between Bank operations and this displacement. In addition, it found that the Bank did not conduct required project assessments – a flagrant violation of internal policies meant to protect indigenous communities. However, the Panel ultimately failed to find the Bank responsible for the harm, effectively absolving it. Last month, Kim pledged to “do better” and released an action plan outlining steps to “improve the protection of people and businesses that may be resettled as a result of a World Bank-funded development project” and to strengthen accountability. The plan falls short in several ways. It makes no mention of the Inspection Panel and how it can be reformed to realize the Bank’s “renewed” commitment to accountability. The plan was also announced without consultation with the very civil society groups that work on resettlement issues, and thus it does little to quiet lingering distrust of the Bank’s promise to change its ways. A drastic rethink of the Bank’s approach to accountability is necessary. As a start, the Bank should reform the Inspection Panel and make it a robust, independent mechanism to resolve grievances and provide meaningful redress. Specifically, civil society representatives should be involved in the selection of Panel members to safeguard the institution’s independence. Second, to the extent the Panel offers dispute resolution, it must be done by professional mediators adept at dealing with power disparities. Additionally, the Bank must commit to stronger, more comprehensive policies that protect vulnerable communities, taking into account the feedback it has received from civil society groups to ensure that policies better protect human and environmental rights. Finally, the Bank should change the incentive structure for staff. Today, career advancement, in part, depends on quickly completing projects and disbursing money. Going forward, staff should be rewarded based on the benefits that projects bring local communities. These recent failures at the Bank present a legitimacy crisis. To restore its credibility, the Bank needs to rethink its approach to accountability and the reforms needed to achieve it.